Peter Bee, a Smart car enthusiast wanted somemore power out of his little Smart ForTwo. The original Mitsubishi engine in the Smart ForTwo made about 60hp, and through some tweaking he managed to get this up to 100hp. But it wasn’t enough for him. He approached Z Cars, a kit car company specialising in putting motorcycle engines into cars. Z Cars had put Yamaha R1 engines into Mini Coopers. They seemed like the right people for the job. He also approached Phil Seton of Seton Racing, who provided a personally tweaked Suzuki GSXR1000 engine (stuff like Yoshimura exhausts, etc) which made a maximum of 180hp, screaming all the way up to 13,500rpm. The engine was mounted at the rear of the car. The result was called the Smartuki, a mash of the names Smart and Suzuki of course. 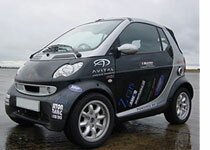 The Smartuki goes from 0-100km/h in 4.2 seconds, does the 400 meter dash in 12.4 seconds and tops out at 213km/h. There are two videos of this monster after the jump. The pocket rocket sounds like an F1 car on the track… enjoy!